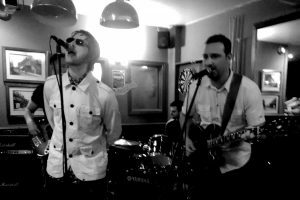 LOCAL Oasis tribute act played to a packed-out pub at the Pound Pub Co on Saturday 12 May, writes Louisa Magnussen. The band fought feedback issues in the first half and a slightly dodgy rendition of She’s Electric but came through in style during the second half with classics such as Wonderwall and Champagne Supernova, which a crowd of roughly 40 people sang along to with delight. The pub was full with revellers and local Pound Pub Co regulars as the band played the same instruments as Oasis and donned the classic sunglasses reminiscent of the original band. Their clothes, hair and stage presence all matched that of Oasis themselves and lead singer Jez pulled off Liam Gallagher’s signature vocal stylings throughout the show. The band certainly hope so as they gear up for a gig at After Dark in Reading on Saturday 14 July.